Ask an average football fan about the biggest German football clubs, and you're bound to hear the name of SV Werder Bremen mentioned a lot. They are the eighth most successful club in the country, with four national titles, six DFB-Pokals and one Cup Winners' Cup. 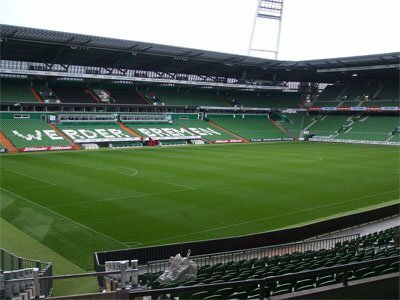 They are one of the top two sides in northern Germany, along with Hamburger SV, with whom they share a long-standing rivalry. Werder was founded in 1899 (as FV Werder Bremen, the name shifted to SV Werder Bremen in 1920; SV standing for Sportverein, meaning sports club in English), by a group of sixteen young men who had just won a football for placing first in a tug-of-war competition. The club got off to a nice start by winning a couple of local championships, as well as becoming the first football club in Bremen to charge admission for its games. After playing second fiddle to Hamburger SV for the bigger part of the Oberliga Nord period (1947-1963), the club finally won its first trophy (a DFB-Pokal) in 1961. As the second best club in northern Germany, they were invited to become one of the sixteen founding members of the Bundesliga. And while they won the Bundesliga in its second season, Werder did not manage to sustain their streak of good results for too long and eventually plummeted to the bottom half of the league, remaining there for a while. It wasn't until Otto Rehhagel's appointment as coach that their luck had turned around. In his fourteen years with the club (1981-1995), Rehhagel had plenty of time to acquaint the team with his "kontrollierte Offensive" philosophy. His work started paying off dividends soon enough, with Werder winning two Bundesliga titles in 1988 and 1993, two DFB-Pokals in 1991 and 1994 and their first and, so far, only European trophy: the Cup Winners' Cup in 1992. Rehhagel's departure was a big blow for the club's officials, who changed many coaches before finally giving the job to Thomas Schaaf in 1999. During Schaaf's fourteen years in charge, Werder emerged as one of the top contenders in German football. They won a DFB-Pokal in Schaaf's very first season with the club, and followed it up with a "double" in 2004 and another DFB-Pokal in 2009. The logo consists of a diamond shape with a "W" (obviously for Werder) inside. On the kit, a star is sometimes added above the crest indicating three league titles.